Frisco Rowing Center is dedicated to providing the opportunity for people to participate in the wonderful sport of rowing. We believe the sport of rowing enhances health, and longevity while providing opportunities to improve personal growth through teamwork, coordination skills, and physical fitness. We are a 501 (c) 3 nonprofit, all volunteer organization. Frisco Rowing Center is also dedicated to supporting community and environmental organizations in promoting clean water for recreation. Our members range in age from middle school youth to senior citizens including former Olympians and National Team members, collegiate rowers, competitive master’s rowers, as well as those who row for recreation. The rowing center has recreational, adaptive, and competitive programs and welcomes new rowers with a series of beginner lessons. We offer several events for the community and host two regattas per season. We are members of US Rowing. Members may race in US Rowing sanctioned races. We have a wide variety of shells for members to use: 4 Open water single shells (Echos) suitable for beginners; 3 intermediate level shells (Maas 24); 1 Open water racing shell (Ace), 9 racing shells (2 Peinert 25, 7 Peinert 26); 5 doubles (1 lwt Wintech, 1 mwt Wintech, 1 hwt Kaspher, 1 Wintech 30, 1 Alden 18; 2 quad/four convertibles (Vespoli and Wintech). 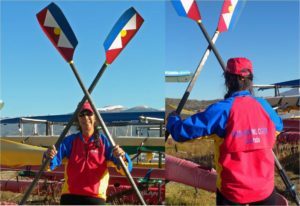 Members have a wide variety of sculling oars to choose from from different manufacturers including Dreher, Braca, and Concept and several sets of sweep oars. Coast guard approved PFD’s (personal flotation device) are available and required for all members which is a belt system which inflates and turns into a life vest. We are located at the Frisco Bay Marina which has both indoor bathrooms and a few portable toilets. There is a restaurant onsite which opens at 11 am. We have 2 docks and our boats are stored outside on racks in the summer. We have a hospitality tent with a picnic table and a storage shed. A boat house is part of Frisco Marina’s future plans. We order team clothing from time to time in a group purchase: rowing-specific jackets, long and short sleeved tops. We usually carry caps and T-shirts.and bumper stickers in stock.